We’re a kettlebell exclusive studio dedicated to making fitness instruction affordable. It’s cardio. Strength training. Fat burning. Tabata and interval training techniques. Anaerobic. Aerobic. Don’t be surprised to heft sand bags, heave a battle rope or throw a cast iron kettle bell in the air. All of our workouts use kettlebells and include strength and endurance elements that will challenge you every minute of the class. Our mission is to ensure individualized attention and safe and expert instruction without the lavish price tag of personal training. At The Warrior Room, every single work out is custom designed by our trainers. 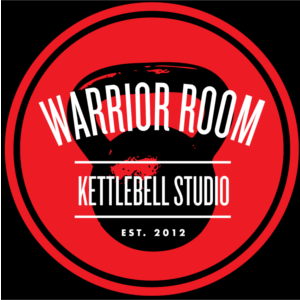 Unlike regular gyms that offer monotonous large group classes with almost no personal fitness direction, The Warrior Room offers all our workouts under the direct supervision of our trainers. All of our classes are capped, ensuring that every warrior receives safe and expert fitness instruction without the lavish price tag of a personal trainer. Every day, our trainers generate new workouts designed to tax every part of the body. You’ll constantly be challenged with challenging and always fresh work outs. Ch-ching! Our cost! The average cost of a personal trainer in Portland is $60 to $70 an hour! By offering small personal classes, we’re able to affordably train our clients so they will see results both quickly and safely. Your first class is FREE! We ask that you take the Free Kettlebell Basics class first, so that you can learn the kettlebell movements safely and with plenty of personal attention. Please take a minute to sign the online waiver and sign up for your preferred class time at The Warrior Room.